Literary Classics: Judah's Scepter and the Sacred Stone earns the Literary Classics Seal of Approval. Judah's Scepter and the Sacred Stone earns the Literary Classics Seal of Approval. Author D.A. 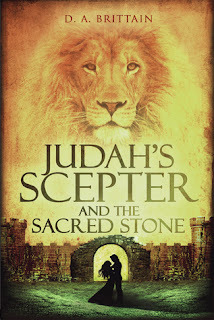 Brittain's Judah's Scepter and the Sacred Stone is a tale of adventure and romance. Shining light on the story of Princess Teia Tamar, this novel offers a fascinating conclusion to what may have become of the little-known daughter to the last King of Judah. Some theorists believe the princess may have traveled with Jeremiah, the prophet, to Ireland following the overthrow of Judah by Babylon. This novel chronicles Princess Teia's desire to follow the will of Yahweh, and the struggles she endures as she travels with Jeremiah as they seek God's intended path for his people. Brittain has woven a unique tale of romance that is altogether intriguing. The author's grasp of history and biblical scripture is apparent throughout this thoughtful and introspective novel. Her depiction of Jeremiah the prophet, as he yearns to share the truth of God's desire to be at the heart of one's life ambitions, offers a wonderfully uncommon perspective of this man's role during this pivotal time in history. A captivating and compelling work of historical fiction, based on biblical scripture and some historical conjecture, this book has many levels of depth and won't soon be forgotten by readers of any age. Judah's Scepter and the Sacred Stone is recommended for home and school libraries and has earned the Literary Classics Seal of Approval.